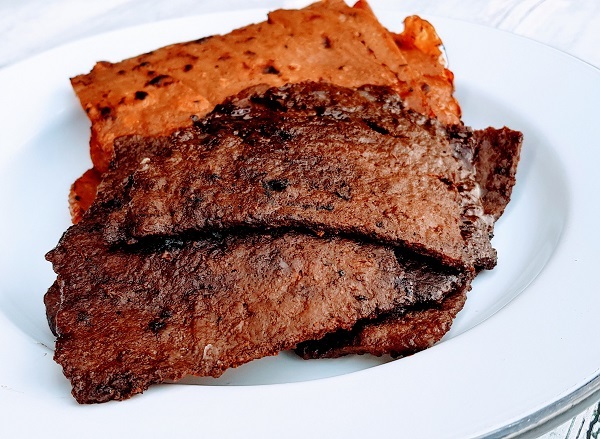 I grew up in the part of Malaysia where this is known as “long yoke” (Cantonese & Hakka), and for a long time after coming to Australia, I had no idea what other people were talking about when they made reference to “bak kwa” (Hokkien) – more evidence of how gloriously splintered Malaysia can be when it comes to food, language and dialects. The most popular version of Long Yoke, aka Bak Kwa, is made with pork, but since I don’t eat pork, I make mine with chicken mince. I could have sworn my parents used to make it with sliced beef as well, but it’s late as I type this, and I don’t want to wake my poor stepmom up with a phonecall to check. In any case, in this Live Asian Kitchen broadcast, I had some beef mince (not sliced beef) to use up, so I decided to make a batch with it, and it was far superior, in my opinion, to the chicken mince version. It didn’t help that the chicken I was using was a fine mince (unlike the coarser grind I used to use when I made it for my business), so the texture came out weird, like devon. This was the recipe I dug up from my restaurant files, though in all honesty I can’t be sure if it was really the same one we used back in the day (I haven’t made it in years), since I vaguely remember adding red food colouring to ours, which isn’t listed here. Place all ingredients in a mixing bowl, use a pair of chopsticks or a fork and stir vigorously in one direction until a gluey paste is formed. Place meat on a large piece of parchment paper. Roll into a thin sheet (about 2mm thick). Bake at 125°C for about 20 mins. Increase temperature to 180°C and bake for about 20-30 mins or until the sides are charred.